succulent secret: brining the chicken first. “The brine makes the chicken so tender and juicy and gives it an entirely different flavor that’s so much better,” he explains. Chef Brian Obermeyer has cooked at local favorites such as Pastis, Haven, Villagio Italian Kitchen and the Buckhead Diner. Roasted Chicken Piccata’s not always on his menu, but now it can be on yours! refrigerator for as long as possible but no longer than 24 hours, after which point the chicken becomes too salty. Remove chicken from brine, rinse and pat dry. according to package directions, drain and set aside. liquid, bring to a simmer and whisk in 2 tablespoons butter. Add freshly chopped parsley, toss cooked pasta in sauce, and season to taste with salt and pepper. Divide pasta, slice chicken diagonally on the bias, leaving it on the bone, and place on top of pasta. Garnish with freshly grated Parmesan to taste, and serve. 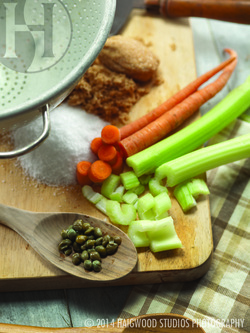 Combine ingredients in a separate stockpot filled with enough water to cover chicken and ice. Bring to a boil and stir to ensure salt and sugar have dissolved.